Back in February this year, I received an inquiry from “A”, who wanted to have her mother’s autobiography published as an ebook. The book, titled “Daughter of the Torguts”, was first published by China’s Peasants Reading Publishing House in 2004. Now that it is out of print, “A” would like to help her mother, Ms Man Lin who lives in Beijing, to publish it in multiple digital formats in both Traditional Chinese and Simplified Chinese. 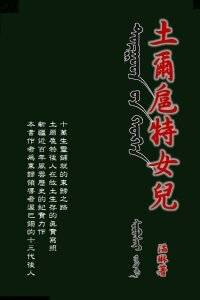 “A” took the trouble to scan the whole book into 12 huge PDF files, and it took me six months to type out the 80,000 or so Chinese characters and to format them into various ebook formats. In this way, I re-lived the life experiences of Ms Man. I was deeply touched by the numerous turns and twists of her story, first as a princess of the Torgut Mongols, then as a professor in China’s top military universities, and finally as a woman who is grateful for the everlasting support of her loved ones. The return of the Torgut Mongols from Russia to China in 1771 is a rarely known event. The size of the migrating group has been variously estimated to be 150,000-400,000 people. However, due to thirst, starvation and raids by Russians and other ethnic groups throughout the six-month journey, only 85,000 made it back to China’s north-western region alive. Once home, the Torguts were divided by China’s Qing Government into several groups and settled across various regions between today’s Xinjiang Province and Mongolia. Another group of approximately 70,000 Torguts stayed behind in Russia, along today’s Volga River, and became what is now known as the Kalmyks. Ms Man is the 13th-generation descendent of Ubashi Khan, the legendary man who led the Torguts home. In Daughter of the Torguts, she recalls hundreds of years of the people’s history not only in China but around the world. It is a personal and realistic account of the birth of modern Xinjiang and her people’s continuous struggle for freedom and independence. Ms Man details how her ancestors roamed across Northern Asia until their nomad lifestyle came under threat by the expanding Russian Empire. Having suffered unspeakable losses of lives and belongings, their journey back to China was and still is considered as an act of great patriotism, a historical tribute to the almighty Chinese civilization that unites and assimilates all of its minority ethnic groups. However, throughout its history, China has never been a nation of harmony and peace. Ms Man details how the Torguts became a pawn in early 20th century in the great chess game played out by the country’s Nationalist Government, the local warlords, the emerging Communists, the invading Japanese and the always ambitious Russians. At the age of 22, her father was imprisoned by the then leader of Xinjiang Province and injected poison that destroyed his sanity. She recalls how, as a young girl, she often lay on her bed at night, alone and trembling, listening to her father screaming until he was coarse, begging “them” to stop torturing him. It is a chilling account. And there was no peace even after the New China was established in 1949. Ms Man recalls how, throughout her life, her mother had been determined to restore the autonomous status of the Torgut Mongols. A woman forever fighting for the welfare of her people, she was imprisoned during the Cultural Revolution and ended up raising chicken in a remote farm as an exercise to “serve and learn from the peasants”. Ms Man writes how, at the age of 12, she visited her mother in prison and saw her being paraded on streets. It is heartbreaking. Ms Man’s story as a child growing up in 20th-century China is equally touching, if not more so. Her fierce desire to be accepted as an ordinary person led to her decision to pursue academic excellence. Later she joined the People’s Liberation Army and became a brilliant teacher in China’s Air Force Command College, where she devoted her time to cultivating creativity and innovation. It is here that she had proved herself, not as a princess, but as an outstanding intellectual who deeply cares about the future of humanity. It is uplifting to read the results of her diligent and thorough research, not only on the art of military commanding, but on the plight of the Torgut Mongols in every corner of the world. I eventually learned from Daughter of the Torguts that “A” is the oldest of Ms Man’s three daughters. It is heart-wrenching to read the author’s account on how, many years ago when she was ill at home, the then two-year-old “A” and her younger sister climbed onto a stool and cooked a soup for their beloved mother. As a publisher, I am deeply honored to have this opportunity to publish Ms Man’s autobiography, a book of undying hope and courage, full of light at the end of a dark and long tunnel. As a writer, I understand and share her gratitude for the existence of those who love her. As a reader, it remains my hope that her life story can touch more people not only in Chinese but also in English. More details about Ms Man Lin’s Daughter of the Torguts as a Chinese ebook can be found here.